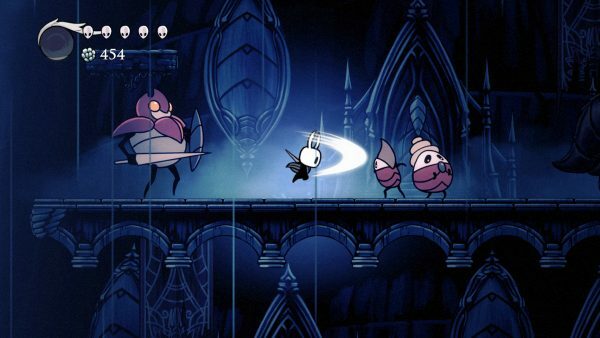 Ever since Hollow Knight had come out on the PC last year by developer Team Cherry, I had heard rave reviews about it. I heard about it fondly from friends and fellow reviewers alike and since I am not as much a PC gamer, it made me immensely happy to see there were plans to bring it to my favorite console, the Switch. 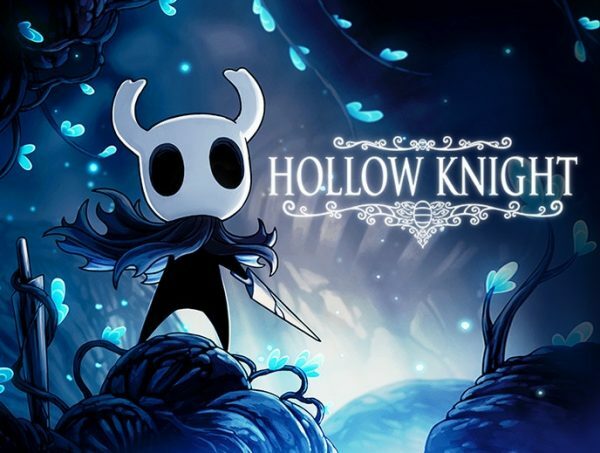 Now with the game out on Nintendo Switch it is time to take a look at Hollow Kniogt as I am a huge fan of dark, Gothic aesthetic and I also enjoy very much enjoy Metroidvania style games. For the uninitiated, Metroidvania style games are a sub genre of action adventure games that combine mechanics of both Metroid and Castlevania games. Some key features are large maps to explore that have some parts blocked by obstacles that need to be overcome usually through the process of obtaining special items or skills. They are typically sidescrolling platformers with very careful attention to character and level design. Story, level design and character progression need to be tightly woven together to successfully pull off a Metroidvania game – for a classic example of this done right think Castlevania: Symphony of the Night. An engaging metroidvania needs to encourage exploration and experimentation to get the player immersed in the world and characters. 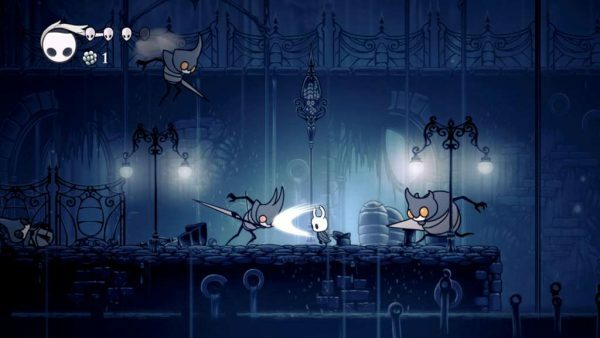 With all of this in mind, Hollow Knight had a lot to pack in such a small package of sidescrolling platforming, map exploration, upgrades and engaging lore. I was certainly hoping the game could live up to the hype surrounding it. 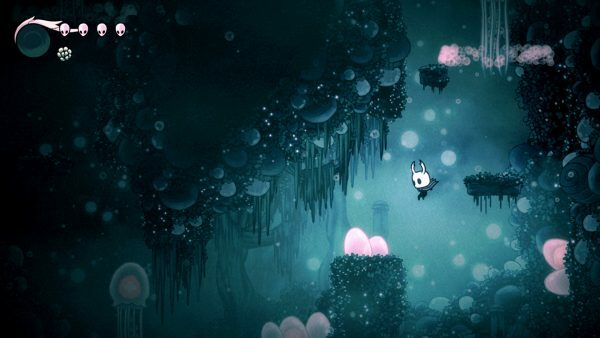 The first immediate thing I noticed with Hollow Knight is the atmosphere and aesthetic. Now, This may be the horror fan in me desensitized to a lot of horrific imagery, but I found the atmosphere to be almost whimsical along with Gothic. Yes, there are skulls, spikes, insects and a dark, bleak color palate, but there is also a charming fairy tale like feeling to the game – bold hand drawn animation combined with post-processing effects and smart lighting lighting choices gives the world of Hallow Nest an otherworldly feel . The Knight as a character, as well as others, are certainly designed in a very cute illustrative way and this helps with the fairy tale feeling. The plot also inspires thoughts of old fairy tales as well. The story of a Knight fighting against the evil deity like creature ruling as Queen of the bug-kind and meeting all sorts of monster and friend alike along the way. Much like Bandai Namco’s Dark Souls series – the large calamity has already occurred. Rather than being “the chosen one” or an anointed savior, The Knight is learning about the environment and picking up the pieces alongside the player. Even with that said there are great battles, deception and a hero’s inner conflict as well for good measure to be found within. All of this combined makes everything very dream like, surreal, and it all just won me over and showed me why so many others have fell in love with Hallow Knight. As with many Metroidvania games, this game has many difficulty spikes to be found within the exploitable caverns, lush forests and other environments. I am not usually turned off by games that are designed to be challenging – but there were times with my time with Hallow Knight that I had wished there was a few changes to make the game easier. I understand many people were satisfied with the games difficulty level, but other difficulty modes might have been welcome and something for Team Cherry to maybe consider when creating future games. Hallow Knight doesn’t provide a lot of modern quality of life mechanics that have become common place – things like completely visible maps and even way-markers that lead the way are present when the Knight begins their journey. Potential players will need to pay attention to areas of the map that are impassable as they likely will become paths to new areas with just a single upgrade. 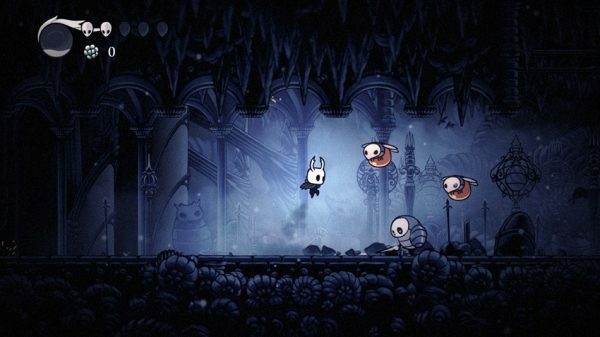 Overall, Hollow Knight is a very pleasant game that provides an old school challenge and some very challenging optional content for those looking for a real trial. Its a great addition to the Switch and great to curl up in bed with on a dark and stormy night. If you desire another challenging side-scrolling Metroidvania game with a beautiful Gothic aesthetic and enchanting story / setting, this is definitely a title to pick up, especially for the Switch. Get yourself immersed in this beautiful world that was so carefully designed with intricate detail and nuance. The developers clearly are passionate about their project and made something very special in a genre that has nearly saturated the market with both good and bad games. This game is anything but hollow and deserves the attention it gets.